I’m just going to go ahead and say it. 2015 is already better than 2014. These 7 days put the previous 365 days to shame. We spent New Year’s Eve in a surging hoard of Germans, all pressing toward the stage in front of the Brandenburg Gate, where David Hasselhoff (yes, that David Hasselhoff) was performing, just like he did 25 years ago shortly after the fall of the wall. Did you know that Germans have an unhealthy obsession with this man and his music? Did you even know he made music? Neither did I, but I found out the hard way. Thankfully, the musical portion of the evening lands squarely in the middle of the large hole in my memory that begins with a cup of hot mulled wine in on a crowded street and ends with watching Baywatch on Erin and Oliver’s couch sometime in the wee hours of the morning. Lest you think I spent the whole week in Berlin in the midst of a 90s hangover, I should tell you that we spent at least half of our time visiting a combination of museums, palaces, and historic sites and the other half eating. Like many European cities, Berlin has centuries of fascinating history to discover, from Frederick William to Frederick the Great, through two World Wars, and the incredible stories surrounding the Berlin Wall. Every museum, in addition to some truly amazing collections, has photographs of the damage the bombings wrought and the palaces are missing much of their original furniture, wall coverings, and ceiling frescoes, all of which burned in the War. Throughout the city there are pieces of the Wall or cobblestones marking where it used to stand and even the S-Bahn ghost stations have exhibits and plaques documenting stories of families who escaped from the East through the rail tunnels. One of the perks of visiting Germany during the holiday season is the proliferation of Christmas markets, groups of temporary huts and stalls, selling spices, leather goods, jewelry, food, and hot mulled wine. One of the downsides of visiting during the winter months is the complete lack of daylight, which was limited to 7 hours a day, and the cold, which was the damp and dreary type that makes you want to wear all the clothing you own at once and then crawl under the covers. So, if you want to turn a quick buck, I highly recommend setting up a hot mulled wine stand in Berlin, immediately. As promised, I consumed massive amounts of schnitzel, bratwurst, spaetzle (my all time favorite), potato dumplings, and sauerkraut. There was also wine (of both the hot and cold variety), some very strange German liquors, and beer (of course!). Food and beverage are incredibly inexpensive in Germany. A heaping plate of meat, potatoes, and sauerkraut can be purchased for 7 euro and a large stein of beer for as little as 2 euro. But as any true American is obligated to do, I must admit that when it comes to beer, America does it best. Germany is flush with pilsners and light lagers that are reminiscent of yellow water. Luckily, Oliver took us to a great beer bar, run by a girl from San Francisco, who culls a collection of really excellent German beers, brewed mostly by American ex-pats. I must also admit that coming back to America, where the sun rises before 9am and stores stay open past 8:00pm, was rather refreshing. Matt and I suffered through a week of jet lag in Germany, which has made returning to Eastern Standard Time pretty darn easy. However, we also returned to some pretty serious winter weather. It’s twelve degrees here today and so I’ve been inspired to cook the warmest, most comforting, and (wait for it….) healthy meals I can muster. 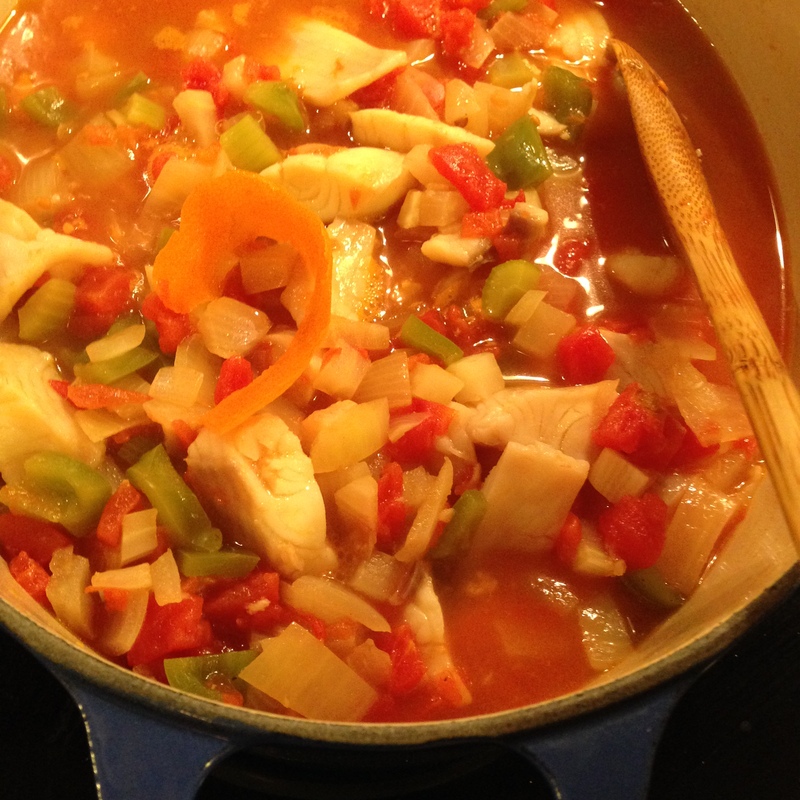 Our first dinner at home was one of my favorite soups, a fish soup that reminds me of one my dad used to make. His version used Pernod instead of actual fennel, which would have been a nice addition, but Matt and I aren’t grown-up enough to keep a fully stocked bar. Still, this soup is perfectly satisfying, especially with the heat from the chile and the tang of the orange, and very quick to prepare. Heat the oil in a large Dutch oven or soup pot over medium-high heat. Add the onion and cook until softened, about 5 minutes. Add the garlic and cook for 30 seconds. Add the celery and cook until tender-firm, about 3 minutes. Add the bell pepper and fennel and cook for 1 minute. Add the tomatoes with their juices, water, bay leaf, chile, orange zest, salt, and black pepper and bring to a boil. Reduce the heat to medium-low and cook until the broth thickens a little and the fennel is tender, 15 to 20 minutes. Add the fish and cook until just done, about 5 minutes. Remove the bay leaf, chile, and orange zest. Stir in the lemon juice. Serve garnished with the chopped fennel fronds. Tags: fish, German food, soup, travel, winter | Permalink.